The SpeedStrobe is designed for use with all turntable speeds. This is the easiest to use turntable speed tester on the market today. All that is required to check the speed of your turntable is the ability to read the numbers on the SpeedStrobe disc while aiming the battery-operated strobe illuminator at the disc. The SpeedStrobe is 99.99% accurate. Works with both 50 Hz. and 60 Hz. power systems since the strobe illuminator is battery powered. 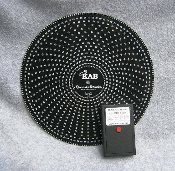 Please check our KAB Product Information page for more on the SpeedStobe.